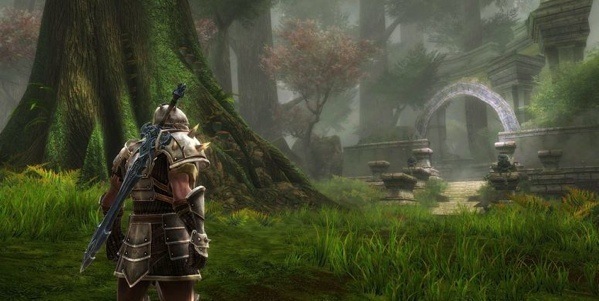 Curt Schilling and company made a lot of promises last year about Kingdoms of Amalur: Reckoning, the first title from 38 Studios' long-awaited IP. He said that we'd see "combat that keeps you doing combat" along with a "deep quest narrative" and old-school RPG tropes brought around to match up with action gamer tendencies. "I don't know a way to tell you," Schilling said at the time, that "'Hey, we're taking God of War and marrying it with Oblivion.'" That's a tall order, made even taller by 38 Studios' origins -- while there are a lot of veterans working on this game, this is the first time they've all worked together, and certainly there's enough pressure and hype on the project that it seems like it could very well fall apart in disasterous fashion. And then we saw the game running in full motion for the first time this week here at GDC 2011. Sure, it's only an hour of directed gameplay, and sure, there's lots of work yet to do on the title. But there's this: All of Schilling's promises were up there on the screen, and it seems more likely than ever that 38 Studios might just pull this off. Combat is certainly a focus -- it starts out simple, with just a few one-button combos using your first weapon. But soon a shield gets added into the mix and you can learn to not only block attacks but also parry them when timed correctly, causing a stun or extra damage. 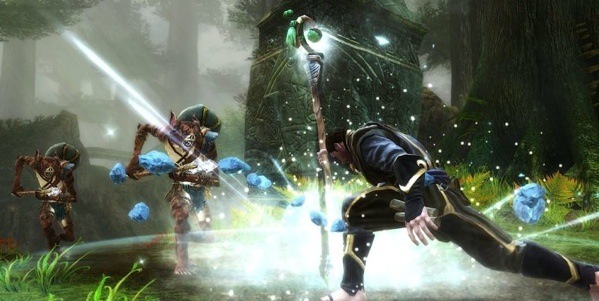 Soon, you can assign multiple weapons to the various buttons (the warrior I saw wielded a broadsword and a hammer, and could switch them up instantly), and doing things like holding them down or pressing them in a certain timing sequence creates all sorts of flashy and rewarding action combos, even including things like aerial launches and juggles. There are even -- yes, God of War-style -- quicktime events, usually the last enemy in a sequence, that use extra button presses for extra damage and action. The combat is more like Bayonetta than Kratos, actually -- even the warrior adds a little magic to his attacks to bring spikes up out of the ground or slash with a flaming sword. Loot upgrades also contribute to the combat -- there's a dynamic gear system, complete with crafting and gem slotting, and adding attributes to weapons not only upgrades the behaviors, but their look as well. Even early game, the weapons look epic -- I saw a gigantic broadsword with ornate metal inlays, and a huge hammer with blue magical details. I asked Big Huge Games' Studio Art Director Tim Coman how he dealt with making high level gear look appropriately powerful when it started out so over-the-top, and he had a simple answer: "We worked with Todd McFarlane, that's all I'll say." 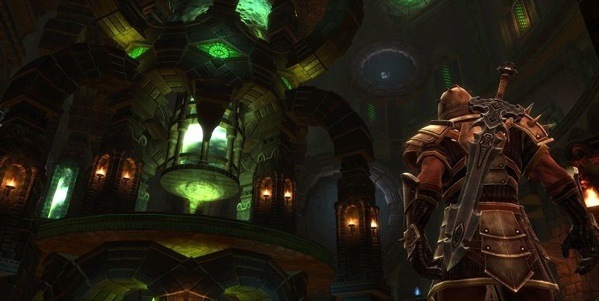 The visuals extend to the world of Amalur: Put simply, it's gorgeous. The concept artists must have had a field day, because every environment is sensationally colorful and dynamic, and faithfully recreated in the game world as light streams through forests and torches burn in dank caverns. There's a day/night cycle, and the environments look great in both, and because the world is full of ruins and secrets and magic, it looks like it's been capital-C Created. The Well of Souls is one of the first sights you see in the game, and so writer R.A. Salvatore's influence is felt right away. "In the early sketches of the well," says Coman,"we had all kinds of tubes, and one of the things we wound up going back on is saying that we wanted it to be more of a magical experiment." No steampunk, in other words, but definitely a coherent and well-built fantasy world. The role-playing side of the game is also filling out well. Rather than choosing a class before you start the game, 38 Studios is filing characters into "destinies," picked for you according to your character choices across talent trees for Finesse, Sorcery, and Might. "As you invest points into the various skill trees," says executive producer Mark Nelson, "you unlock new destinies. If you start investing points into Sorcery, you unlock Apprentice Mage and then Wizard and Archmage if you're just plugging the one line. If you invest into Might as well, you unlock Battlemage and Spellsword, your kind of combo destinies." And while those are all familiar to fantasy RPG players, Reckoning's Mage has some new tricks up his robesleeve. While you can sit back and shoot spells, Big Huge Games wants you in the action, so magical combat is just as flashy as melee, with the caster teleporting around to dodge, swinging his staff around, and attacking with a midrange dual-disc weapon called a chakra. Mage purists may cry foul, but it was refreshing to see a caster in combat. "Gandalf was a melee mage!" Nelson reminded me. There are still a few hiccups to fix -- the game's UI was a little uneven in this alpha version, and while some of the animation was very detailed, other moves are not well done (while flipping a big lever at one point, the huge warrior character simply bent down gently as if he was pressing a button). The quest system was a little rough, and while I was told that there was lots of storytelling going on, not a lot of it made sense during this quick demo. That said, there are some excellent UI choices as well -- loot can be easily compared and upgraded, and on first glance, there are hotkeys to directly equip new items or "Add to Junk" to be sold off to vendors later. And the game design in general seems solid, with lots of hooks in the open world to explore and conquer. And that art! If you liked the look of Darksiders, another game designed by a comic book artist, you'll love this one. In hindsight, it's easy to see why Schilling said the things he did last year about this game. We're still a ways away from release, but if the game is as good as it looked here at GDC, 38 Studios might just fulfill all of the hype.